The Akai MPX261 Controller Keyboard is one of the keyboard controllers from Akai Professional providing hands-on music production capabilities with modern DAW control. The MPK2 series features a full-size, semi-weighted keybed available in 25-, 49- and 61-key models. With a slim, stylish design, the Akai MPX261 keyboard sounds professional and looks great. Experience expanded control of your VST instrument and effect collection with MPK261 and VIP3.0 (Free Download Included). VIP3.0 provides you with unparalleled access to your virtual instrument and effect collection, seamlessly integrating the hardware / software experience and grants the unrestricted freedom to create in a user-friendly, intuitive format. 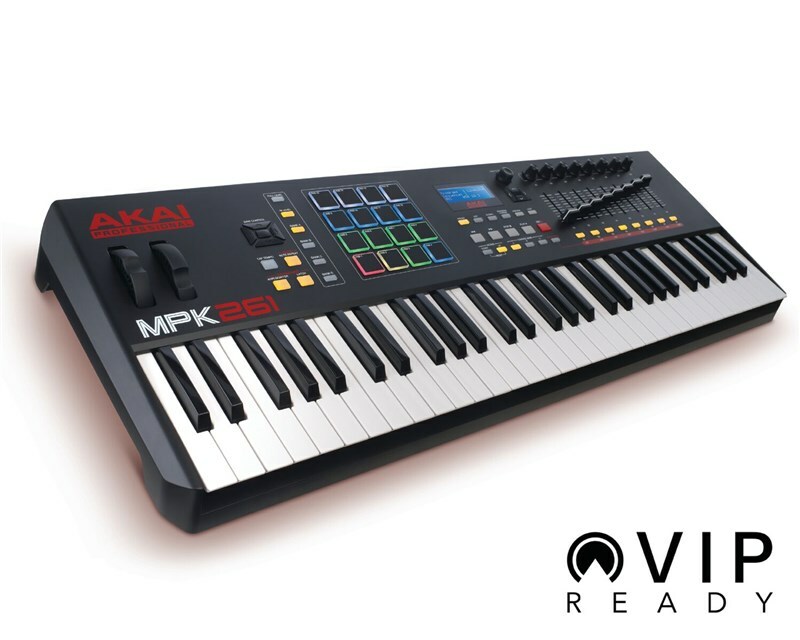 The combination of VIP and MPK261 maximizes workflow and ensures a playing experience that feels natural and enhances creativity – the natural, tactile feel of hardware fused with the unrivalled processing capability of virtual Instruments. Engineered to be an all-in-one controller solution, the Akai Professional MPK261 is a performance pad and keyboard controller that combines deep software integration, enhanced workflow, and core technologies from the iconic line of MPC workstations. Each member of Akai Pro's MPK series comes fully loaded with a comprehensive interface for manipulating virtual instruments, effect plugins, DAWs, and more. 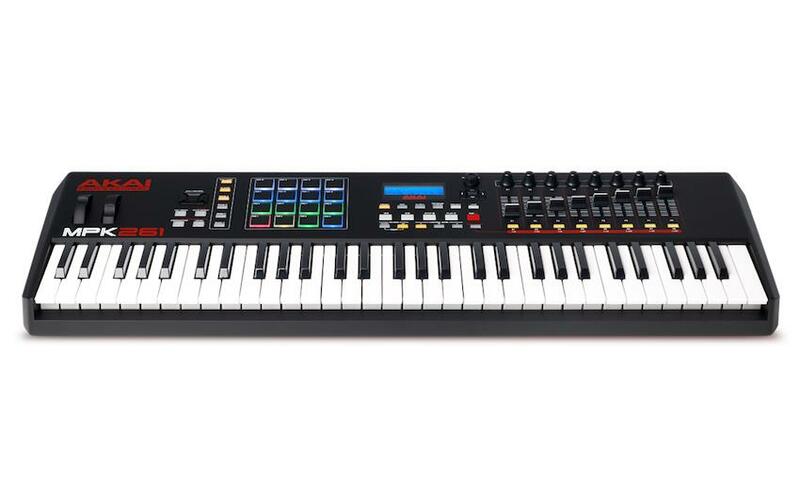 MPK261 features 61 semi-weighted keys with aftertouch, 8 assignable knobs, faders, and switches, 16 MPC-style pads with RGB feedback, and onboard transport buttons. Three banks expand the number of knobs, faders, and switches (up to 24 each), and four pad banks expand the number of pads (up to 64 total). Plus, MPK261 is optimized to interface directly with your Mac or PC with USB power and plug-and-play connectivity. MPK261 comes equipped with 61 semi-weighted, full-size keys and a premium piano-style keybed for unprecedented response and natural feel. Each key is velocity-sensitive and outfitted with aftertouch for dynamic, expressive performances and recordings. In addition, onboard Octave Up and Down controls allow players to access the entire melodic range. Bundled with MPK261 is SONiVOX’s Eighty-Eight Ensemble, an authentic grand-piano virtual instrument, that lets you compose or perform with pristine, expertly voiced piano samples. Classic MPC Swing, MPC Note Repeat, MPC Full Level, and 16 Levels are all onboard for further inspiration. With MPK261, musicians and composers can incorporate genuine MPC workflow into their productions and create with the tools that producers have relied on for years: MPC Swing lets MPK261 users obtain that tight, organic groove that made Akai Pro’s groundbreaking MPC music-making machines so legendary. MPC Note Repeat and 16 Levels make it easy to build beats and construct short melodic sequences using the MPC-style pads. In addition, an arpeggiator, with adjustable resolution, range, and patterns, enables users to explore complex melodic ideas, effortlessly. MPK261 is armed with powerful production software—Ableton Live Lite and MPC Essentials—for out-of-the-box music creation. Ableton Live Lite is a fluid audio/MIDI environment that enables musicians and producers to spontaneously compose, record, remix, improvise, and edit musical ideas. MPC Essentials, a groove/beat production and sample-triggering software, can integrate directly into any DAW, such as Ableton Live Lite, or run standalone. In addition, it extends the power of MPK261 by adding up to 8 pad banks and 4 samples and insert effects per pad. A world-class piano instrument and two high-definition virtual synthesizers bring the best of sample-based and synthesis technology to MPK261 users. SONiVOX Eighty Eight Ensemble is a recreation of the Steinway 9-foot CD 327 grand piano layered with additional orchestral and synthetic instruments for rich, cinematic sounds. Hybrid 3, by AIR Music Tech, is a versatile virtual synthesizer that combines the warmth of legendary analog synths with a full range of futuristic, digital manipulation capabilities. SONiVOX Twist, a spectral morphing synthesis virtual instrument, makes it easy to create serious sounds using simple controls.